"It was a pleasure to work with Dorothy during our search for a vacation home in Ocean City, NJ. She took the time to understand our needs and helped us find the perfect property for us. Her exceptional knowledge of the market allowed us to purchase the property we wanted at an excellent value." "I worked with Dorothy Phillips in June-August 2010 as an independent construction contractor and consultant. While working together I found Dorothy to be professional, punctual, while always keeping her clients best interest at mind. I would highly recommend Dorothy to anyone looking to purchase or sell a home or property at the southern NJ shore area." "Dorothy is a detailed professional who looks out for her customers. I would highly recommend her." "I have known Dorothy and her family for many years as our families grew up in the same community in Cherry Hill, NJ. I began working with Dorothy as a Mortgage Loan Officer providing financing for her clients. Dorothy is a consummate professional and has a passion for selling Real Estate in the Jersey Shore market. She has a grip on the every changing market and is an expert on where to find the best deals for either the investor, second home owner, or primary resident! She knows where to get the best deal! Dorothy also surrounds herself with the best team and resources which is a reflection of the superior service she provides to her customers! Her expectations are simple; she demands the best service and follow through of herself and anyone that works for her or has contact with her customers. I would recommend Dorothy to friends, families, and business associates with confidence!" "Dorothy has referred many clients to our company throughout the years. The referrals are evidence that Dorothy places her client's objectives ahead of her own. We have found that most Realtors are unfamiliar with 1031 Exchanges. However, Dorothy's professionalism and knowledge of real estate enables her to make suggestions and provide guidance to clients where others fall short. We enjoy working with Dorothy and hope to continue our business relationship with her for many years to come." "Dorothy has done an outstanding job in providing her expertise and service to her customers. She is extremely knowledgeable and was a pleasure to work any issues that arose during any real estate transaction. Highly recommended." "Dorothy listened at each step of our house hunting and kept fine tuning the selection of homes to look at...personable and hard working. Do currently recommend to others and would be my first call if I am in the market to buy or sell again"
"Dorothy executed the sale of our home quickly and professionally. She was always available and we had a great experience. I would highly recommend her to anyone interested in purchasing property at the shore." "Dorothy is a dedicated professional who works tirelessly for the best interests of her clients. She is an expert on Ocean City property and a pleasure to work with." "Dorothy Phillips is the consummate professional. She is dependable and always does what she says she will do. I would call on Dorothy for professional advice and assistance whenever the need does arise." "Dorothy did an excellent job throughout the entire process associated with the sale of my mother-inlaw's home. She was extremely patient and sensitive and went out of her way to assist my mother-in-law through not only the technical side of the sale but also the emotional. Dorothy's approach and knowledge gave us a great deal of confidence that we could rely on her advice and counsel. Through her attention to details and extraordinary efforts, the sale was successfully completed to our complete satisfaction." "Dorothy was outstanding. She understood what we were looking for, established realistic expectations and worked the system to secure a property that is more than we hoped for. She is very diligent, hardworking, personable and a joy to work with. She is smart and very business savvy. I knew we would love working with her from the moment we first started renting in OCNJ many years ago. I will whole heartedly recommend Dorothy to all of my friends." "Dorothy and Nicole bring a wealth of experience, integrity, and professionalism to their craft. Our transaction was completed efficiently, and we were well informed throughout the process.  If you are buying or selling at the shore, you want to call Dorothy Phillips to be your ally." "My experience with the Phillips Group has been wonderful. I felt "well taken care of" throughout the entire process. All of you are so supportive and work so hard to find the ideal place for your clients. I so appreciate your calling current owners to see of any were willing to sell. The paperwork process from agreement to final closing felt like you handheld end me all the way. I so appreciate your shopping for insurance rates, having inspectors to choose and an attorney and title company - like a turnkey operation. Thanks. I would recommend the Phillips Group again and again. You guys are great." "Best experience we ever had buying or selling real estate! A dynamic team oriented group who met every need we had in purchasing our dream beach house!!!" "Dorothy, we want to let you know how thankful we are for all of the hard work you and your staff put in, in helping find another shore house after selling our other house. We appreciate your efforts which were never ending. With your help, you showed us several houses that you suggested that was in our price range and we found a house that was a perfect fit for our needs. You can be sure that if any of our friends want to buy a house at the shore, you will be the one that we recommend. Hopefully someday we can upgrade to another shore house and you will definitely be the one we call. My wife and in-laws thank you as well as they are enjoying the property as well." "We at Patriot Land Transfer have been working professionally and personally with Dorothy Phillips and her excellent team of agents for over 8 years now. Regarding Dorothy's team; they are second to none! Dedicated, hardworking, attention to detail and a high level of integrity are the first adjectives that come to mind when referring them business or handling their title insurance needs. Dorothy's right hand Nicole is sharp business woman! Nicole can handle (multi-multi task) all aspects of the real estate transaction from start to finish. This requires a great deal of the behind the scenes "know how" and the ability to work extensively with others in creating a seamless purchase or sale. Nicole does just that on a consistent basis. Dorothy Phillips and The Phillips Group at ReMax at the shore will give you the intangibles that all buyers or sellers are looking for; Professionalism, Integrity, Dedication, attention to detail, hardworking and the ability to produce YOUR desired results in YOUR time, not theirs." "We would highly recommend Dorothy Phillips at Remax. Dorothy and Nicole went above and beyond to find the perfect shore home for us. They offered great advice, were wonderful negotiators, and "held our hands" through the whole house-hunting process. They appreciated our desire for the "perfect house" and helped us weed out the not-so-perfect ones. They were patient with us, which we appreciated, and were very knowledgeable and helpful." "It is difficult in today's business world to find a person or a group of people, who possess a sense of professionalism with a high level of competence and a commitment to servicing their customer. We can say without hesitation that Dorothy Phillips and her whole team were the most impressive real estate people that we ever had the pleasure to work with in buying or selling real estate. We have purchased and sold nine residences, in several states. So, we speak from experience when we make such a strong statement. From the moment Dorothy started to make a presentation to us on the methodology she and her team uses to sell properties, we knew that this was a true real estate professional. Her marketing tools went beyond the usual print, add placement and a web site. The use of internet marketing, e-mail marketing data mining from sales inquiries and selective cold calling form the basis for a very proactive marketing plan. Her knowledge of the local real estate market plus her review and analysis of comparable sales and properties were instrumental in establishing a realistic sales price. In addition, she made suggestions to make our home more attractive to prospective buyers. After we selected The Phillips team to sell our house, they were in constant contact with us. We were always kept informed when something was happening and someone was always available if a prospective buyer happened to see the For Sale sign and called the telephone number on the sign. In fact, we went away for five weeks while the house was in the process of being sold and this team was in constant contact whenever they needed to be. Dorothy and her entire team made the sale of our house very easy and pleasant for us. Their professionalism, competence and caring attitude were always on display. They are a high level group that work as a team to do the best for their clients. If we were to ever move back into their area, we would contact them immediately. That is the highest recommendation anyone can make." "Remax, Door to the Shore gave us personal attention throughout the whole buying process. Communication was always fast and informative and not only did they find us the right property, but they provided educated comps as they know the area so well. I would highly recommend the Phillips Group!" "Having bought and sold several homes in the last 15 years, we have learned how important it is to have a good realtor working with you. Dorothy was referred to us by a friend and when we met her, we immediately knew that she was a 'good one'. Dorothy's knowledge of the market was key in helping us to find the right house. Her staff is extremely professional, conscientious, and a pleasure to work with. There is no way we would use or recommend anybody else in OC!" "The Phillips Group laid out a Plan for us, executed the Plan, and sold our property within two weeks. Another realtor could not do so in several months. We were very pleased with their knowledge, professionalism, and personnel." "Our recent experience with The Phillips Group was truly exceptional. Dorothy and her entire team are very professional and knowledgeable which proved invaluable leading us through a very complex transaction resulting in the purchase of our new shore home. We were very pleased and appreciated the unwavering commitment, excellent communications and diligent monitoring that ultimately concluded with a smooth settlement. We would highly recommend the services of RE/MAX At The Shore! You have clearly earned the respect and gratitude of your new clients! It is not hard to see why the Phillips Group has distinguished itself from their competitors! Thanks again for a job well done." "The nicest comment we can make about working with Dorothy and her team is that we felt like family. We felt that our best interests were always forefront and even though we weren't buying an expensive property we felt we were important to them. Our seller was difficult to work with and Dorothy and her team helped us work through the issues and come to a mutually satisfactory agreement. Not even hurricane Sandy and the loss of their offices, which occurred in the middle of us signing a sales agreement and making settlement, seemed to be a problem for them and we know that it must have been, professionally and personally. We highly recommend working with Dorothy Phillips and her team of professionals." "Dorothy and her team were very professional and helpful to us as we navigated the waters of purchasing a property one week after Hurricane Sandy hit! We appreciated their attention to detail and their cheerful and pleasant approach despite the fact that they, too, were trying to clean up from one of the worst storms to hit the Jersey coast. Even after purchase, Dorothy is prompt with returning phone calls and has been helpful to us as we rehab our property. We look forward to continued association with her company." "If you are looking for a group who puts your best interest first and exudes the following qualities: honesty, approachability, integrity and proficiency--then the PHILLIPS GROUP is the one to hire! We meant with Dorothy Phillips twice before we placed our home in her professional hands. One month later, a deal was negotiated and then Nicole Farina, Dorothy's right and left hand, took over the process. She guided us painlessly through all requirements needed for a successful settlement exactly one month later. The PHILLIPS GROUP exemplifies "customer service"!!" "“I wanted to thank you for all that you and your group have done for me and my wife with our purchase of our beach home. I went off a recommendation from a friend of ours who trusted you and your group. From the very beginning you had my best interests at heart. With us primarily living in Colorado and originally from Pennsylvania if was a huge help having you walk us thru the process. Having complete trust is huge for me and your recommendation’s were spot on and lead me to have a hard decision on a lot of properties. In the end you made it very easy being a liaison between myself and the seller. Even after the sale you and your group continue to follow up and myself and the needs for making the move even easier. The attention to detail and thoroughness is awesome. I felt that I was part of a family from day one. To me makes a huge difference at the end of the day if I feel comfortable with realtor or not. The fact that I was 1,800 miles away and took care of and continue take care of me is a big sense of relief for me. I’m not sure words alone are enough to say thank you. But THANK YOU. I would highly recommend the Phillips group they did and have done a phenomenal job for us." "I used the internet to contact five realtors in the Ocean City area when I wanted to sell my vacation home. Dorothy Phillips was the only broker to contact me by phone and to see the residence that very same day. She and her team were consummate professionals in every way from the beginning of the process until the day of settlement. Our home sold in six weeks, and Dorothy’s associate, Nicole Farina, guided us through the myriad of paper work and inspections that followed with a smile and attention to detail that made the entire experience relatively stress free." "My family and I met Dorothy six years ago. We were flying in from Dallas and had 48 hours to locate and purchase the perfect home for us in Ocean City, NJ. Dorothy (and Nicole) navigated everything seamlessly, successfully and in record time! They were delightful to work with. Despite Dorothy's busy lifestyle, she has not forgotten us in the six years we have lived in Ocean City! We recommend Dorothy to everyone we know who is thinking of purchasing a shore home." "Dorothy sold our OC home quickly and then found us one in our desired neighborhood that had everything on our checklist and more. She and her team are true professionals." "The Nicest Thing about The Phillips Group is Their Teamwork cannot simply be matched. It’s not just an individual effort to get you the house you desire." "The service provided by the Phillips Group was superior at every level. We really enjoyed working with Nicole who made the process almost painless. I plan to recommend the Phillips Group to anyone I know that is planning to purchase or sell a property in Southern New Jersey." "Dorothy and Nicole are on the Ball! I have come to expect poor quality service these days and was pleasantly surprised by the top quality service provided by these ladies! My questions were answered promptly and completely. They went over and above to make sure I understood everything and also helped me with inspectors, insurance, and others since I am not from the area. They were a great help, pleasant, knowledgeable, and Fun! I could not have had a better experience. Thanks Ladies!" "A team that works well together, responsive and timely. The interactions are straightforward and to the point."